Fed up with Lucy's constant fibbing, Ricky and the Mertzes bet her a hundred dollars that she can't go twenty-four hours without telling a lie. Lucy accepts the challenge before realizing she must attend a bridge game at Caroline Appleby's. Obliged to be candid, she untactfully tells Caroline what she really thinks of her new Chinese Modern furniture. Marion Strong gets frank opinions about her new hat and way of laughing (Lucy: "Marion, stop cackling. I've been waiting ten years for you to lay that egg!"). Lucy also finds herself in the untenable position of having to answer truthfully questions about her age (thirty-three), weight (129 pounds), and the original color of her hair ("mousy brown"). At home, she accuses Fred of being a "tight-wad", Ethel of "looking tacky", and Ricky of being a "coward" for not letting her have her fling at show business. Lucy: "You're scared to death I'll steal the show!" Ricky takes her to a TV show audition where she is asked to list her talents: "Lucille McGillicuddy - singer, dancer, comedienne, monologist, mistress of ceremonies, after-dinner speaker, saxophonist, star, bit player, or extra." When questioned on the matter of experience, Lucy hedges by saying she has just finished an eleven-year run at Ricardos ("a three-ring circus") and has appeared in "3-D" (not three dimensional films, but her apartment number). She finally lands the job of assistant to Professor Falconi, a knife thrower. Lucy has managed to tell the truth and Ricky and the Mertzes pay up. Special Notes: The Ricardo apartment number was changed from 3-B to 3-D for this episode to fulfill the joke about "3-D". 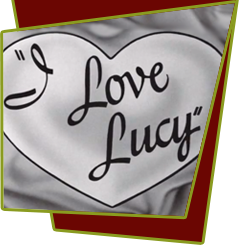 This episode is based on lucy's radio show, My Favorite Husband, Episode #29, "The Absolute Truth". Bloopers: While Ethel explains to Fred and Ricky on how Lucy will lose the bet, a moth flies into the scene and hits Ethel in the face. They couldn't do a retake, because the studio had a "no retake rule."